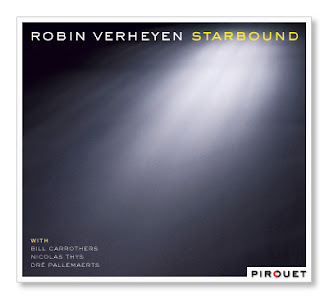 Jazz Station - Arnaldo DeSouteiro's Blog (Jazz, Bossa & Beyond): CD of the Week - "Robin Verheyen: Starbound"
Featuring: Robin Verheyen (soprano & tenor saxophones), Bill Carrothers (acoustic piano), Nicolas Thys (acoustic bass) & Dré Pallemaerts (drums). New York-based Belgium saxophonist Robin Verheyen's "Starbound," reveals masterful clarity and atmospheric depth. The young saxophonist's Pirouet debut is a CD for listeners who want to be challenged and who treasure the art of nuance. The many subtle shadings are more and more fascinating with each successive listening of this session recorded in a single day (April 24, 2009) at Pirouet Studio, in Munich, produced and engineered by the label head, Jason Seizer, who later did the mixing, on September 1st, 2009. Then the album was finally released last October 30 in Europe. Seldom is there such a concentration of talent. Robin Verheyen is a Belgian who has made New York his home. Now in his mid-twenties, Verheyen has already gathered up a considerable list of prizes - and an astounding variety of musical endeavours - to show for himself since his youth. At the age of 18 he was already playing in a big band under the direction of renowned American composer Maria Schneider; at 22 he moved to Paris, at 23 to New York. He won prizes as best soloist at festivals in Brussels and the Basque town of Getxo, and one for composition at the gathering in the Parisian district of La Défense. But what is much more impressive than all the success is the music to be heard on "Starbound." The pieces reveal a soloist of enormous flexibility on both soprano and tenor saxophone. The majority of compositions are by Verheyen, and they are pieces with an especially sensual strength and lyrical beauty.